Whether it is to see these the great cliffs of the Jurassic Coast, to bird watch, to take photographs or film or simply for a relaxing cruise around the harbour we’d be delighted to take you out on our motor cruiser. Top Hat is a Botnia Targa Motor Cruiser. Targas are recognised as one of the most capable craft made and are often rated in the top slot in magazine reviews. The layout of Top Hat means it is a great platform for both stills and video film work. The photos below were taken in Cowes when it was the TV Boat for the Americas Cup Challenge. Mounted with an unbelievably expensive gyro stabilised video camera Top Hat performed impeccably during the week and made it round the south side of the Isle of Wight in a force 6-7 still filming the whole way. With 520Hp on tap it is also capable of a fair turn of speed (top speed over 40 knots) and is highly capable even in some fairly unpleasant conditions. Top Hat is available for night charters to see the fireworks in Poole or Bournemouth too. 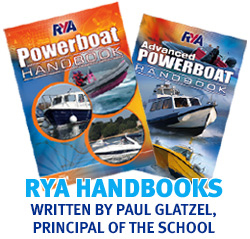 Call 01202 686666 or email office@powerboattraininguk.co.uk for more information.